Ferienwohnung Gloria in Garmisch-partenkirchen is an apartment building. Ferienwohnung Gloria is located in Garmisch-Partenkirchen old town. Boasting a balcony, the apartment is in an area where guests can engage in activities such as skiing and cycling. The apartment is located on the first floor and features a flat-screen TV with satellite channels, a well-equipped kitchen with a dishwasher and an oven, and a bathroom with a shower and a hair dryer. There are some bus stops in front of the property that will take you directly to the city centre. Munich Airport is 1...30 km away. 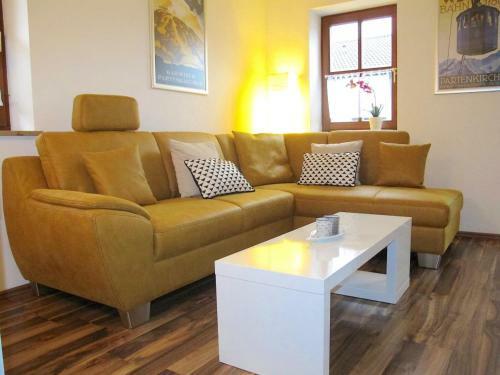 Ferienwohnung Gloria is located in Garmisch-Partenkirchen old town. Boasting a balcony, the apartment is in an area where guests can engage in activit...ies such as skiing and cycling. The apartment is located on the first floor and features a flat-screen TV with satellite channels, a well-equipped kitchen with a dishwasher and an oven, and a bathroom with a shower and a hair dryer. There are some bus stops in front of the property that will take you directly to the city centre. Munich Airport is 130 km away. When would you like to stay at Ferienwohnung Gloria? Payment before arrival via bank transfer is required. The property will contact you after you book to provide instructions. Please inform Ferienwohnung Gloria in advance of your expected arrival time. You can use the Special Requests box when booking, or contact the property directly with the contact details provided in your confirmation. A damage deposit of EUR 150 is required on arrival. This will be collected as a cash payment. You should be reimbursed within 7 days of check-out. Your deposit will be refunded in full via bank transfer, subject to an inspection of the property. Please note the property will send a separate confirmation with detailed information (bank transfer instructions, check-in and key collection details). Guests expecting to arrive after 18:00 are kindly asked to contact the property in advance in order to get the information about the key safe.